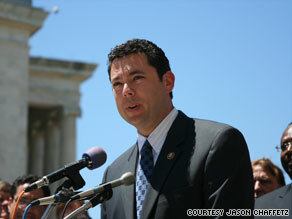 Editor's note: Rep. Jason Chaffetz, a Republican, represents the 3rd District of Utah in Congress and is appearing in CNN.com's "Freshman Year" series, along with Rep. Jared Polis, a Democrat from Colorado. Jason Chaffetz says cap and trade and health bills could cost jobs and increase costs for consumers, business. (CNN) -- This July brought a very pleasant first experience -- my first Fourth of July holiday as a member of Congress. I have celebrated the Fourth of July all my life, but participating in stirring celebrations as a representative of the patriotic people of Utah brought a profound sense of responsibility and pride in my country. We have much to be grateful for. However, this year of firsts is not all so pleasant. June brought an inevitable but unpleasant first experience -- the passage of an energy bill I believe will have disastrous consequences for the people of my district. July brings another unpleasant first experience -- the introduction of a health care plan that falls short in addressing America's needs. I'm concerned that we are pursuing a direction that will only exacerbate our economic woes. Given the size of the Democrat majority, it's fair to say the House has passed a lot of legislation I disagreed with. But I've never felt more disconcerted about the potential impact of a bill as I have felt about the cap-and-trade -- or more accurately cap-and-tax -- bill. I believe the House has passed what is, in effect, the biggest tax increase in United States history. The projections of what this bill will cost "average Americans" vary widely. But one thing we know for certain -- this bill picks winners and losers. My state and 39 others are disproportionately targeted. Some states, such as those from which the bill's sponsors come, will see a huge windfall. Other states, like mine, will be asked to generate that windfall. Representatives from the windfall states are quick to tell us how important it is to sacrifice now for clean energy in the future. Of course, for their state, the "sacrifice" is millions in revenues from carbon credits. Commentary: Obama enters "The Matrix"
Many of them receive these credits because their political connections landed them a greater share of free carbon credits or because they have a nuclear power plant -- something they don't want the rest of us to build. I keep hearing that this bill will ultimately reduce electricity costs and create jobs. But I listen to utilities and business groups in my own district who have crunched the numbers. Rocky Mountain Power, which is owned by Obama ally Warren Buffett's company, estimates utility bills will increase by at least 18 percent in the first year, with greater increases each year as the cap is lowered. For a Utah elementary school, that amounts to a $10,000-plus increase in annual electricity bills. Utah school districts stand to pay millions more each year just for electricity. I've heard from manufacturing and technology companies in my district who fear they will no longer be able to afford to produce their products in the United States. Those jobs may well move overseas, where the cost of doing business will be significantly cheaper. Fortunately, the bill has an uphill battle in the Senate. The bill itself troubles me deeply, but just as troublesome to me is the process -- and the precedent -- of passing bills no one has read. Just as they did with the stimulus package, Congressional leaders demanded we vote on a bill no one could possibly have read. I am afraid that the past will repeat itself as we prepare to vote on health care reform. The majority of Americans agree that our health care system is in a state of crisis and in need of significant reform. The House Democrats' plan falls short in addressing America's needs. Their plan would firmly place a bureaucrat between patients and their doctors. Under their vision, Washington would have ultimate control over what is best for patients, which treatments are acceptable, and how long patients wait for needed care. Meanwhile, the plan provides few real cost savings in the way health care is delivered. I support a health care system that is patient-centered, allowing the individual to make health care decisions. I support health care reform that puts the patient's health first, protecting the important doctor-patient relationship. Tort reform, tax credits, and health savings accounts are among the potential solutions to help Americans access quality health care. Expanding government's role in health care will raise taxes, ration care, and let government bureaucrats make decisions that should be made by families and their doctors. Government mandates in health care already encourage waste, fraud and abuse that result in higher costs and more families without care. Hopefully this year of firsts for me can include the first time the 111th Congress DOESN'T pass a major piece of legislation that no one has read. Republicans, Democrats, and independents should all take the time to read and understand heath care reform before Congress votes on it. The opinions expressed in this commentary are solely those of Jason Chaffetz.